Former Aberdeen hero Alex McLeish is heartened by the Pittodrie side's start to the season but thinks Celtic will pick up their fifth consecutive title. The Dons lead Celtic by five points at the top the Premiership after winning their first eight fixtures. "Aberdeen have needed a good team for a long time and [manager] Derek McInnes has done some sterling work over the last couple of years," said McLeish. "Will they win the title? I would say it will still be Celtic." Aberdeen finished runners-up last season, 17 points behind the champions - losing all four league meetings with Celtic. However, they beat Celtic earlier this month, coming from behind to win 2-1 at Pittodrie. "I don't think it's going to be as big a margin as it has been in recent years," McLeish told BBC Radio 5 live. 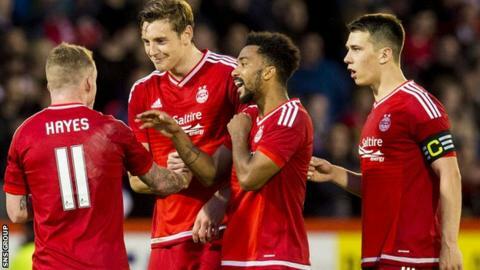 "If Aberdeen can keep the nucleus of their team fit, it could be closer than many people think." Former Scotland manager McLeish, 56, spent 16 years with Aberdeen, winning 12 major honours, including three titles under manager Sir Alex Ferguson. "It's a fantastic run that Derek has got the team on," he added. "I think it even beats our stats in the days of Sir Alex, so I'm a little bit jealous."